Grateful Dead to Reunite in Chicago for 50th Anniversary Shows Independence Day Weekend! "To celebrate the 50th anniversary of the Grateful Dead, Mickey Hart, Bill Kreutzmann, Phil Lesh, and Bob Weir will reunite at Chicago’s Soldier Field, nearly 20 years to the day of the last-ever Grateful Dead concert, which took place at the same venue. 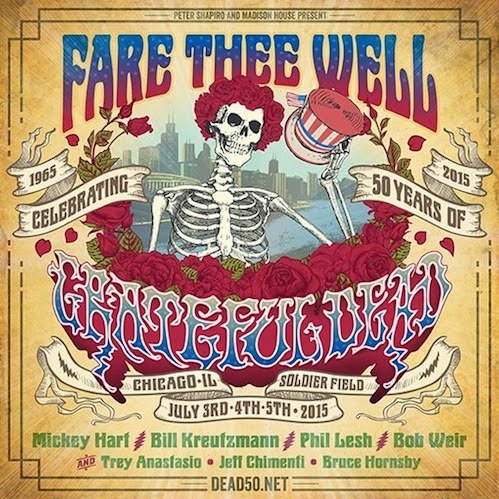 “Fare Thee Well: Celebrating 50 Years of Grateful Dead” will take place over three nights – July 3rd, 4th, and 5th, 2015 – and mark the original members’ last-ever performance together. The band will be joined by Trey Anastasio (Guitar), Jeff Chimenti (Keyboards) and Bruce Hornsby (Piano), and will perform two sets of music each night. In the tradition of the original Grateful Dead Ticketing Service, tickets will be available via a first come first serve mail order system starting on January 20th, followed by an online pre-sale through Dead Online Ticketing February 12th and will be available online to the general public on February 14th via Ticketmaster."